Maybe you are just starting out with a craft hobby or business, or maybe you have decided to downsize your home and are looking for a way to fit everything in smoothly, whatever the reason, you need to get a bit creative. I personally had to figure out how to take a cute craft studio that I had in my last house and put it into our bedroom as we downsized and moved a couple of times in the last year for my husband’s job. We have a small spare room full of books, but the natural lighting is much better in our master bedroom, so this was to be the new home of my craft business. One of the best things we did when it came to downsizing is to get rid of bedroom dressers, and purchase a bed frame for our queen sized bed with built in drawers underneath. Not only did this get rid of any cleaning issues under the bed, we had a place for our clothes as well as the closet and a clear room. This frees up room for other things. After painting the room and placing the bed and end tables, we now had room for my drawing table. I am not done yet, but you can see in the picture that I managed to fit an entire craft room into one side of our bedroom under the window and stay neat and clean. The trick is to have a spot for everything. Hopefully the tips below give you some ideas, and helps you creatively use a bit of extra space in your bedroom for your creativity, whether it is a hobby or makes you money, you still need an organized craft area. Step 1 – Purge – This is no different than organizing any room. The first step is to get rid of things you do not use. You can donate arts and crafts supplies to the Goodwill, and other thrift shops, or you can have a garage sale. I have a habit of building up supplies or keeping leftovers for “one day”, and it can get out of hand. So I decided to get ruthless and use the “5 second” rule. Pick it up, look at it and decide whether to toss, or donate or keep. If you have a lot of finished crafts that maybe didn’t sell, either give as gifts or donate. Step 2 – Take the donations out right away and garbage, so that you can see just what is left. This is a good practice to do once a year anyway, just to see what supplies you have so that you do not double purchase and waste money. You need a clear picture of what is left of your craft supplies. Step 3 – Figure out what type of storage you can afford. You can go low budget and checkout the dollar store, or depending on your budget you could invest in a few key pieces that will keep your area clear but functional. 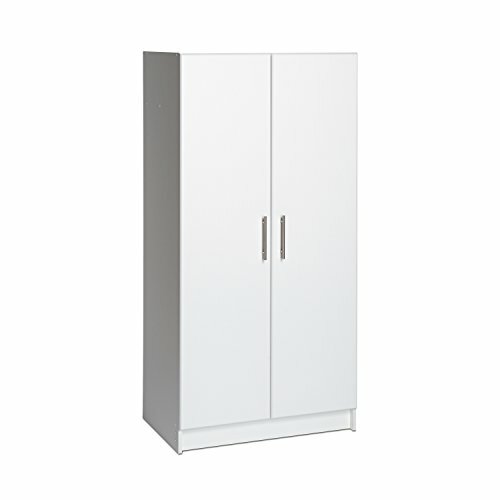 I invested in a drawing table (my craft is drawing) and a tall white cabinet with doors to hide supplies. I also installed some shelves in my room for my reference art books. I managed to fit everything and it felt good after the purge. Check out some of the ideas below, hopefully some will inspire you to get organizing. 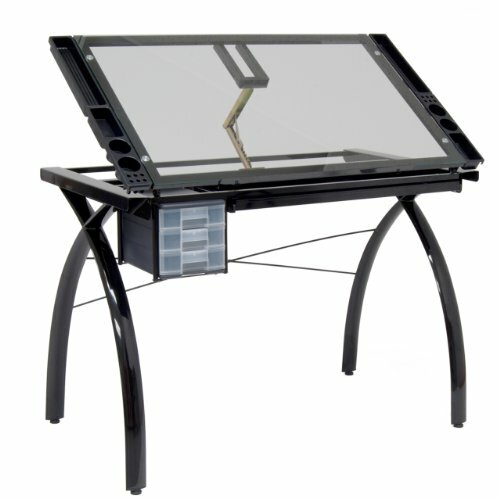 This could be used for painting or drawing or any craft where an angled work surface would be appreciated. It also has a drawer for smaller supplies, such as brushes, or pencils. I placed mine under the window where I was getting a lot of defused natural lighting. I prefer to work during the daytime so this was the perfect spot in our bedroom for my drawing table. It didn’t interfere with the flow of the bedroom, and would have been a natural place for a dresser but since we got rid of ours, I had plenty of room for this drawing table. I also place a plastic office mat underneath so that my chair did not wear the carpet. You can get them at office supply stores or online. After organizing my craft supplies, I had a lot of things I wanted to keep, so I headed to the dollar store and got many storage containers, and then invested in a tall white cabinet, that would still look good in our bedroom but was perfect for storing things out of site. A craft room can look messy quickly if we don’t have a place to put things when we are finished with them. When I had a separate art room, I wasn’t that good at putting things away, I used to simply shut the door, but now that I am sharing space, I wanted a Zen like bedroom without a lot of clutter or mess. So if you can invest in a corner cabinet or find a wall space for a free standing one it is much better. Shelves are another option but then I didn’t want to see my supplies when it was time for bed, I really liked the idea of a cabinet with doors, so the area was clean when I was done for the day. 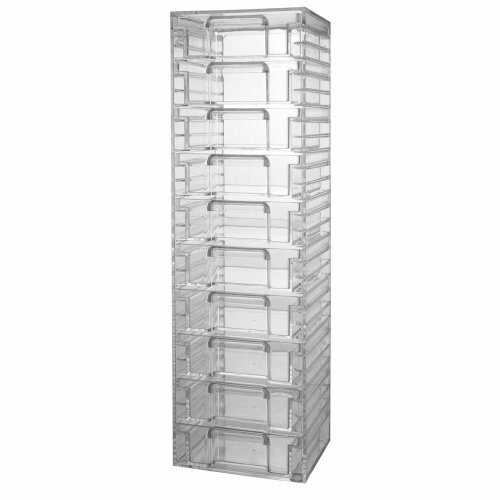 If your crafting is beads, jewelry or scrapbooking and you need to be able to get at your supplies and see them right away, and have a corner you could spare, then I came across this clear drawer tower. It can hold a lot of supplies and yet still keep the room neat and tidy. This is an awesome idea, if you simply don’t have the room to fully setup your crafting zone. You can keep all your supplies in the drawers and even use the surface as your work top; it can then be placed in a corner or in your closet if you have room. You can put away your things quickly and get them out just as fast. 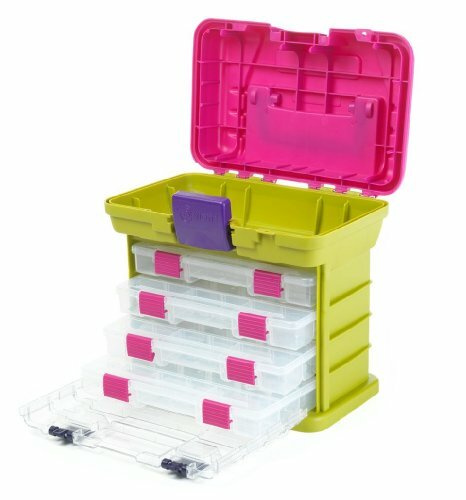 If you like to do your crafts while watching TV or you like to go to any room or out of the house to a class for example, then you can get these really cool crafting cases that hold a lot of goods. This could be kept in your bedroom with a small crafting table. This opens out to display all your supplies. 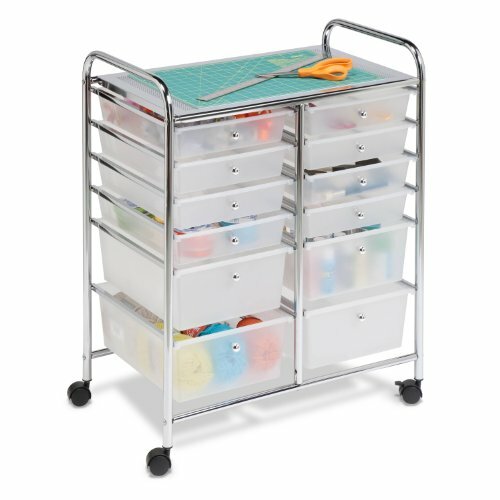 This is great for sewing projects, or embroidery or a great way to take your supplies to the cottage or class. This is really cool if you can afford the investment. It looks like a nice wall unit when you put everything away. 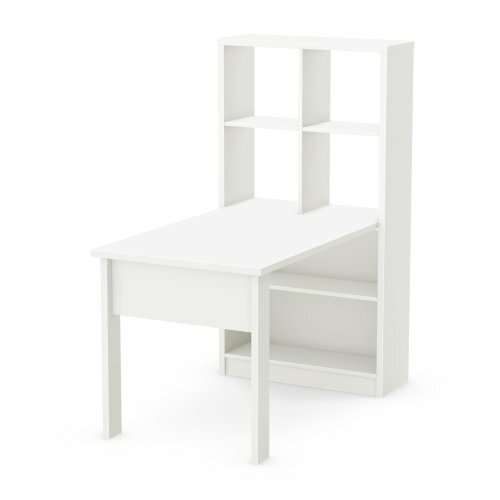 Great for sewing and any arts and crafts, it would fit into a bedroom nicely. Personally I found the best thing you can do is purge first, and then see where you are with what is left. Thrift stores will take extra art supplies, or if you sell in craft shows, create kits of leftovers to see for a couple of dollars. I did this and it was great for kids. As more and more of us downsize, having a separate art studio is not always possible. You can use the spare room if you have one, but there are ways to create craft space in a bedroom that will work in harmony. The master bedroom is usually the largest, so for me it was the best option, but if you get creative as you do with your arts and crafts you will see how much nicer your area can be.